One of the things I struggle with when it comes to my site is how it looks. Just like any other blogger I want my site to look professional, clean, polished and overall inviting. I also want a site that doesn’t take forever to load and is easy to navigate. All of these things encourage site visitors to hang around and come back. With this in mind, I decided it was time for A Relaxed Gal to have a facelift. I felt my current site design as a little clunky, not very feminine and overall a little dated. So I took to the internet to find a pre-made design that worked on the Blogger platform and would fit my budget. Probably six months later, yes six months! I did many Google searches for places with Blogger platform templates, look at where other bloggers got their site designs. I also searched Etsy many times. During these six months, I found several designs that I liked, but there was always one or two things about them I didn’t like that was a deal breaker. They either cost too much, had too many embellishments, I didn’t like the homepage layout or they had an image slider (which I personally can’t stand). I finally settled on a free pre-made template from New Blogger Themes that I customized using my brand colors and typography. I have to admit I’m not head over heels in love with it, but I do like it a lot more than the previous template I was using for A Relaxed Gal. If site design is something you also struggle with or you just want a new look for your blog I suggest you check out these five sites where you can get beautiful pre-made templates. Tiffany Griffin is the creator of the Wordpress blog templates you’ll find on beautifuldawndesigns.com. These pre-made templates are designed with females in mind and can be customized with the fonts and colors you select. The pre-made templates are all responsive and range from $45 to $55 dollars. And if you don’t want to mess with HTML you can get help installing the template for an additional $35. My favorite template is the Serenity Template. I like the clean design, soft color palette and that there are five layout options including this grid layout. This resource for WordPress themes created by Lindsey Riel offers several pretty, feminine templates. I love that each one is unique, customizable and responsive. The pre-made themes range from $45-75. One thing to note is all the templates from Pretty Darn Cute Designs are built for the Genesis Framework. So if you don’t use the Genesis Framework, these templates won’t work for you. If you're looking for a pre-made theme option that is built for the Genesis Framework this is a great option. StudioPress offers a variety of flexible child theme options each with several features like the Brunch Pro theme. Another option for self-hosted WordPress bloggers is Restored 316. Here are you can find many beautiful Genesis Framework child templates. And each template seems to be designed around a key blogging objective. For example, the Refined template is perfectly designed for online entrepreneurs who want to build their brand and sell their wares. 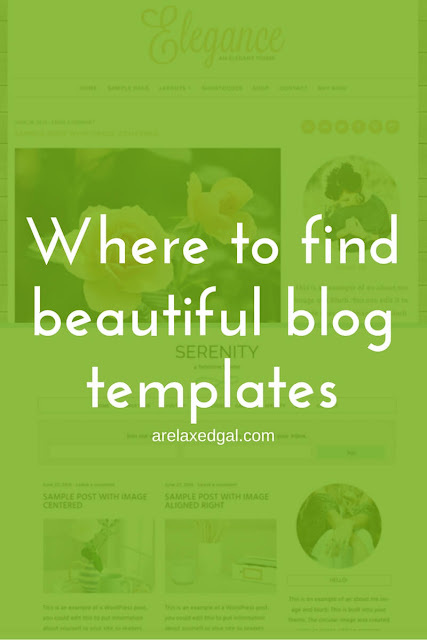 There are many blog templates to choose from and all of them are beautiful, can be customized, and are budget-friendly. If you’re using the Blogger platform, this site is for you. It houses hundreds of free pre-made templates sourced from various developers that can only be used on the Blogger platform. This is where I got my new template. Because these are free templates you do have to be prepared that some of the coding may be wonky, you may have to mess with your CSS and HTML to customize the template and you probably won’t get any assistance from the template maker. Where do you go for pretty blog templates?